MINSK, Belarus (PanArmenian.net)—The President of Kazakhstan, Nursultan Nazarbayev, has introduced two proposals at the current meeting of the Supreme Eurasian Economic Council in Minsk, Belarus, Vestnik Kavkaza reports. Nazarbayev made a statement in which he proposed to dissolve the Eurasian Economic Union and extend the Customs Union by accepting Turkey as a member. He explained that Turkish President Abdullah Gul had spoken to him with a request to join the Customs Union. Armenia completed technical talks on a “deep and comprehensive free-trade agreement” (DCFTA) with the EU in July and was set to sign the deal at a summit with the EU in late November. In addition to a free-trade deal, Armenia has been working towards the signing of an “association agreement” with the EU; a framework agreement on co-operation that is seen as a first step towards political integration with the EU. However, after a Sept. 3 meeting with Russian President Vladimir Putin, Armenian President Serzh Sarkisian announced that Armenia is ready to join the Customs Union, with further plans to be involved in the formation of the Eurasian Economic Union. Putin supported the initiative, vowing procedural assistance to Armenia. Swedish Foreign Minister Carl Bildt described Armenia’s move as a “U-turn” in relations with the European Union. “Seems as if Armenia will break talks on free trade agreement with EU and integrate with Russia instead,” he said in a public Twitter post. Linas Linkevicius, the Foreign Minister of Lithuania, which holds the rotating EU presidency, said Armenia “has blocked its chances of signing a free trade deal with the European Union by choosing to join the Russia-led union.” “We respect any choice of countries but they cannot enter both organizations at the same time because of different tariff requirements,” he said. However, Armenian leadership continues expressing its intention to expand ties with the EU, without contradicting Armenia’s CU membership. “Armenia will take part in the upcoming Eastern Partnership Summit in Vilnius and is ready to sign the Association Agreement,” President Serzh Sarkisian said at an October 2 PACE session. “No Armenia-EU document is being readied to be signed at a Vilnius summit,” the spokesperson of the EU Commissioner Stefan Fule said. “We’re trying to find routes for further cooperation with Armenia, based on existing achievements,” Peter Stano said. what turkic brotherhood ? nazarbayev is al maqtum of central asia.ex-soviet turkic nations exploit the russia they still sleep what I mean if yours had been russia you will understand what does I mean they move russia as a immigrants they bring their families they make alot of childs there are no good future for russia or turkissia 2050. No good news for Armenia. 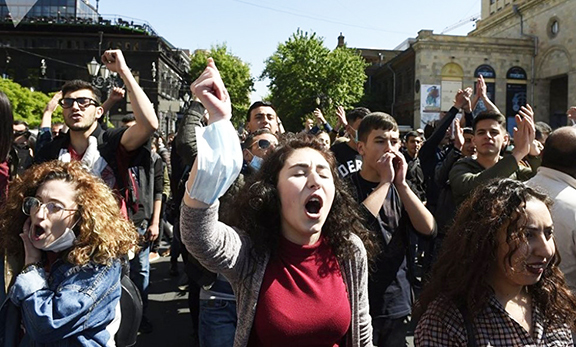 In my view, Russia will pressure Armenian leaders into silence and cooperation. It means, “No celebrations for the 100 years Anniversary; or it will be done informally.” It seems Kazakh President Nursultan Nazarbayev doesn’t respect Armenian leaders. Wount happen ! – ?. Turkey will move its capital to Mecka after the Mideast War Comenses !.